UNITED NATIONS, February 5 -- As the UN's "dry" period, without a UN bar in the Delegates' Lounge, stretches into its sixth week, sources tell Inner City Press a new "floating" bar may open. It would be on the second floor of the UN's new temporary North Lawn building, sometimes called UN-KIA, facing the river. The UN's contractor, Aramak, has been ready to go for weeks. Emails have been exchanged, now getting into such issues as from where the physical bar would come. There's talk of removing the bar in the so-called South Lounge -- right outside the Security Council. This bar, open while Sergei Lavrov was Russia's Ambassador, has been closed for year. Put the bar to use! Meanwhile the UN's revamped cafeteria has opened. Strangely, the divider between the Delegates Dining Room, relocated down from the fourth floor, and the regular cafeteria is no more than a grey velvet curtain. "This looks like a funeral parlor," a source told Inner City Press. "You expect when you look behind the curtain to see gleaming golden caskets." When Inner City Press looked behind the curtain this week, like looking from second class up into first on an airplane, the Delegates' Dining Room was less than half full. U.S. Deputy Ambassador Alejandro Wolff was there, dining with Joseph Vernor Reed. Palestine's Permanent Observer Riyad Mansour emerged to chat with the Press. While the old Delegates' Dining Room is empty, the side rooms are still in use for catered events, the Aramark staff dressed up in tuxedos. Last week Dmitry Titov of UN Peacekeeping's Rule of Law unit hosted an event about human security. An invitee asked the Press to show where the event was held. But in the fourth floor foyer, a security officer apologetically blocked the way. "They've said no Press," she said. It is increasingly that way in this UN. At the end of Security Council presidency reception at the end of January, one wag posited a theory under which the quality of a mission's food is inversely proportioned to its level of democracy. Bad "Western Three" food was contrasted to sumptuous spreads of undemocratic countries. In the UN this is said deadpan, without a hint of irony. Straight no chaser. Like on the North Law soon. 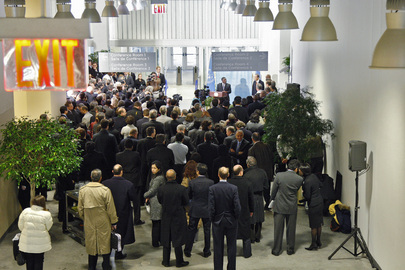 UNITED NATIONS, February 4 -- Following UN Secretary General's largely failed and protested visit to Cyprus, back in New York the UN spin machine doggedly presented things as rosy, alongside an upbeat view of Alexander Downer. Inner City Press: About his trip, I wanted to ask about the reports that, while he was in Cyprus, four of the Greek Cypriot parties, European parties, the Greens and two acronyms, DEKO and EDEK, boycotted his reception. They say because he met with Ali Talat at the presidential office in the break-away region. Where did he meet with Mr. Talat and what’s his response to the boycott by these important parties in Cyprus? Associate Spokesperson Haq: As for Cyprus, I would leave it, as you know, the Secretary-General is on his way back from Cyprus. He will brief the Security Council about this and his other travels tomorrow at 3 p.m., and he will meet with you after that at approximately 4:30 p.m. at the Security Council stakeout. So, I’ll leave it for him to comment. But during Ban's media stakeout on Wednesday, February 3, Inner City Press was not allowed to ask him a question. In fact, no Greek or Greek Cypriot reporter was allowed. The only question allowed by Ban's spokesman Martin Nesirky was from a Turkish journalist. And Ban's answer was, as always, rosy. But is this just propaganda? 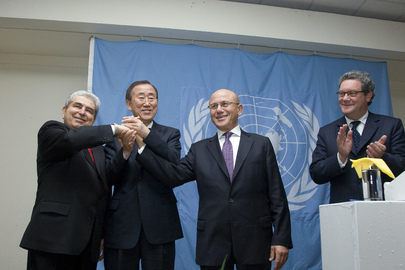 Before the stakeout, a Greek Cypriot told Inner City Press there was no reason to even wait to here Ban Ki-moon speak. Ban has allowed Alexander Downer to destroy the process, he said, opining that beyond himself, what Downer cares about in this post is retaining the British bases. And then there's Downer's claim that his work for business consultancy Bespoke Approach could never conflict with the Cyprus role that Ban has given him. Only at the UN. "I was very much encouraged by such a strong commitment by both leaders to continue their negotiations. And I was again, very much encouraged and touched by the strong support of the people from both sides who were chanting, in unison, shouting 'resolution now.' These were all the loud and clear voices from the general population, regardless of where they were from, both Greek Cypriot and Turkish Cypriot. That was quite moving for me. I felt a strong sense of responsibility [about] what the United Nations can do more to facilitate this Cypriot-led and Cypriot-owned negotiation. My observation was that a solution was possible and a solution was within reach, and, in fact, they made significant progress in power-sharing and governance. I was quite encouraged by this. Of course, there are many more important issues: property; border and security issues. I hope they will continue. President Dimitris Christofias told me that he will issue some sort of plan for further negotiations, despite this planned [Turkish Cypriot] election, and that is quite encouraging. And I am going to have my special adviser, Alexander Downer, continuously engaged, so that this negotiation will be facilitated." Downer, of course, is not "continuusly" engaged -- rather, he is drumming up business for Bespoke Approach. Alternate Foreign Minister of Greece Dimitris Droutsas, whom Inner City Press asked Thursday morning about the IMF, will meet with Ban Ki-moon and then the Press on Thursday afternoon. Watch this site.